The adult leaf miner (Liriomyza sativae) is a 1-1.8mm long shiny black fly with a prominent yellow triangle between the bases of the wings; the underside and the face between the eyes are yellow. Liriomyza trifolii differs in having the thorax covered with overlapping bristles that give them the characteristic silvery grey colour. A portion of the head behind the eyes is mostly yellow in L. trifolii, with only a small black area touching the rear edge of the eye. In L. sativae, the area behind the eyes is predominantly black. The yellowish maggots and the brown, seed like pupae of the three species are too similar to distinguish in the field. Leaf miners produce white oval eggs, about 0.2 mm long, which are at times visible through the upper epidermis of the leaf. The newly hatched larva are colourless and only 0.1 mm long. The fully grown maggot, about 3mm long, has a bright yellow, translucent body, and black mouthparts. Each maggot has a slightly pointed head and a more rounded abdomen. Leaf miners pupa are flattened and segmented. Each segment is bright yellow at first but gradually turns brown. It is oblong-oval in shape and slightly less than 2mm long. The leaf miner found on tomatoes are closely related to the serpentine leaf miner which feeds almost exclusively on crucifers, the vegetable leaf miner infests a wide variety of plants. Some economically important weed and cultivated crop hosts include squash, okra, pea, tomato, bean, cabbage, turnip, potato, tobacco, cotton, radish, spinach, watermelon, beet, pepper, alfalfa, clover, vetch, and plantain. Damaged leaves of tomato have light coloured, irregularly winding mines/channels on the leaves. They are generally S-shaped and may be enlarged at one end. Infested leaves are favourable habitats for invading bacterial and fungal plant pathogens. Also, since heavily mined leaves may have nearly 100% of their mesophyll removed, photosynthetic efficiency is greatly reduced. Severe infestations may cause the foliage to turn brown and appear burned. Damaging infestations are most likely to occur after crops have been treated weekly with insecticides such as methomyl or carbaryl. 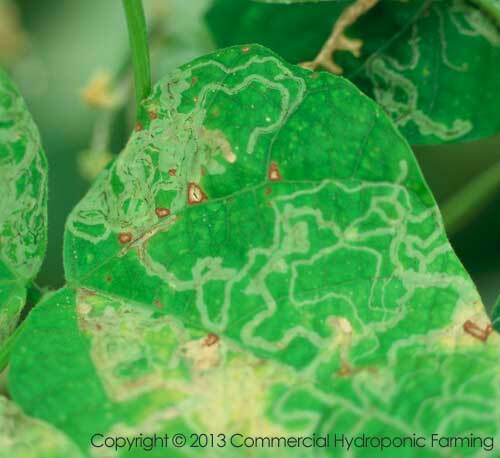 These pesticides kill parasitic wasps which normally keep the leaf miner populations at acceptable levels. Practical on a small scale, the removal of infested tomato leaves helps keep leaf miner populations at a manageable level. The use of insecticides remains the most reliable method of control. A reliable method to monitor leaf miners is to place plastic trays about 300 by 400mm beneath plants at several randomly chosen places. Mature larvae that drop from foliage accumulate on the trays and pupate there, this provides a tool for measuring leaf miner activity in the plants. A treatment threshold used experimentally for L. sativae and L. trifolii is to treat when an average of 10 pupae/tray/day accumulates over a 3-4 day period. Do not treat unless pupae are present. Absence of pupae, even if new mines are present, indicates that natural controls are keeping leaf miners population in check. The success of insecticide applications depends largely on which species is present. The only currently registered material that provides reliable control of L. trifolii on tomatoes is abamectin. A single application of an appropriate insecticide will usually control L. sativae; with L. trifolii, resurgence is more likely, and it may be necessary to treat more than once. Where a series of tomato crops is planted in the same area, you can reduce early infestations in a new crop by rapidly removing old plantings immediately after the last harvest. Leaf miner damage on leaves. Unmistakable tunnels made by the pest.